Found by Barbara Oliva near Cherokee, CA this plant produces large 5" flat blooms. It is a well rounded shrub that would fit well with many locations. Alicia is a 2000 introduction from the Florida breeder Diann Giles. It has bushy growth w/ solitary blooms. This rose was named for Alicia Whidden a trustee of the Heritage Rose Foundation and our friend. The cross is from Vera Dalton and Tiffany. Very upright growth. From 1929 Arrillaga has a strong fragrance from this large, full bloom of some 5 inches. It first opens with a very high center. From 1951, Blossomtime yields a large bloom (4") in exhibition form. Although classed as a Large Flowered Climber, this variety mat be grown as a large shrub. From Australia and bred in 1918 this variety deserves a place in everyone's garden. It will increase in width while staying low growing, continuous blooming and generous with the number of blooms. A 1990 French addition this shrub rose will present you with large blooms. Flowering in groups of 3 to 6. Suitable as a hedge and shade tolerant. A French introduction in the 1850's known for a strong damask fragrance and large bloom. Cornelia was bred in the U.K. and released in 1925. She has a musk fragrance and blooms in clusters. She is nearly thornless, making her easy to train. An 1898 rose, this is a great garden shrub. Deep glossy leaves. La Marne is an Earth-Kind® rose, bred in France, from 1915. It will bloom perpetually if deadheaded. Bred in France and released in 1825 this variety blooms in small clusters. Prolific bloomer with lovely green foilage. An outstanding China. Tea fragrance. Introduced in 1991 and a winner of an American Rose Center Trial Ground Silver Certificate that year this hybrid tea with a fruity fragrance has won many dozens of awards since. The pink in this rose has great depth of color. The growth is very upright with solitary blooms. A plant that carries itself well. A 2013 introduction by Florida hybridizer Allen Whitcomb. Reaching 3-4' in size in each direction. Distinctive color. From 1887, this shorter plant is a good selection for smaller areas. yellow undertones show through at times. From about 1835 this French introduction has a lovely sprinkling of crimson flecks on its petals. Papa Gontier was bred in France and introduced in 1883. He has very large blooms with a carmine pink undertone. A very full variety with generous numbers of flowers. Rhodologue Jules Gravereaux comes from Brazil in 1908. The blossom holds up well as a cut flowers. This was one of the earlier found roses by Ruth Knopf. Grows to about 4' in height with a delicious fragrance. A soft peach color at the center fading to a cream on the outside. Seven Sisters comes from Japan with an introduction date of 1815. It may be much darker than pictured in cooler climates and can show purple, light red, scarlet, blush, etc. in the same cluster. This is a historicaly significant found rose from Ruth Knopf. She found it in several locations on the Caribbean island of St. Thomas. A rapidly re-blooming minature China of the class known as Lawrenciana. We are proud to offer this variety to the rose world. A variety from China which some sources date back to the Ming Dynasty. This variety shows characteristics seen in more modern varieties. 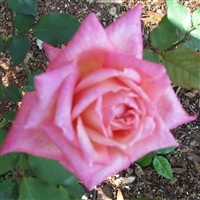 Generally blooming in groups of 4 , with 4" blooms in the cooler months and a very pleasing scent.